Working with industry leaders such as ADT, 7TECH can manage and deliver high quality security and fire protection services to keep your business safe and secure. Choosing the right system will often come down to budget, but there are some key indicators of functionality that wlll help you to choose a system that works for your business premises. Analogue cameras provide a cost effective solution that will allow the system to monitor on area from a static position. IP cameras offer more features and multiple dynamic viewpoints, allowing you to monitor a greater area. Cameras should deliver playback, and digital systems will do this in high definition to capture more defined detail of the monitored area. Infrared technology should be a prerequisite of choosing a system allowing you to monitor day and night, regardless of the level of light available in the area. Recording options are essentially down to the capacity within the system, or the amount of time you wish to record any footage, and the resolution – purely based on system memory. The choice of system will also depend on how you wish to retrieve the recorded footage and digital video records or DVR are the most popular systems available. A large hard drive will allow the DVR to store high resolution footage in periods from days to years, and will allow users to access any footage remotely. A preset event, i.e., the detection of motion, will initiate the recording process and this is a must option for your new CCTV installation. PIR movement detectors form part of the system, or you can choose video motion detector cameras. Our recommendation is to use PIR as it focuses on an area, as opposed to the motion detector cameras only coming to life when it detects motion in the preset area of the screen. Choosing the right option for CCTV is very important, and could be the difference between protecting your important business assets or not. 7TECH will help you to choose the right system, and give you impartial advice on what is best value, but meet with the needs of the business and protecting its premises. 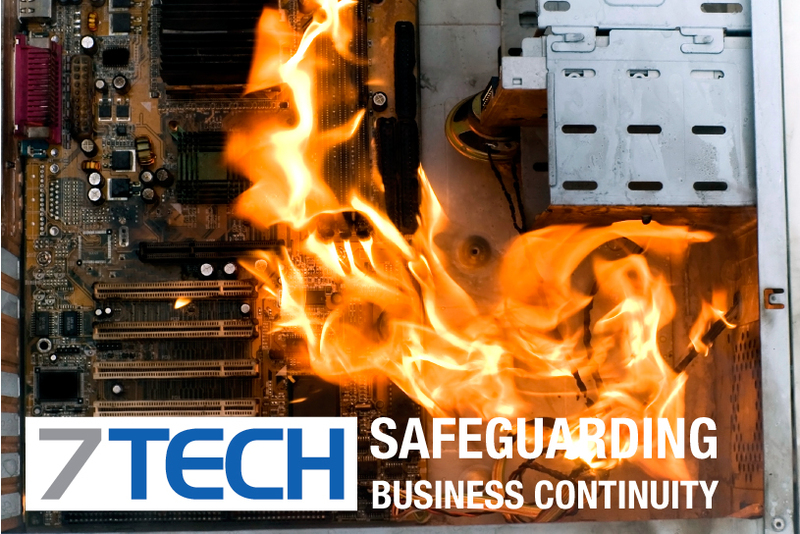 The ability to suppress a potential fire in that very important server room or data centre can save many £thousands, and careful planning to choose the right fire protection infrastructure is incredibly important for most businesses and their business continuity plans. A fire suppression system is there to quickly and automatically extinguish a fire in the location, and without the need of human intervention. Clean air systems should be a consideration for server rooms and data centres. Strict guidelines are in place for fire suppression systems, as the agents that are activated should this occur can be dangerous if not designed correctly for purpose. The use of Argon/Nitrogen with a small element of CO2 to displace any oxygen will reduce the oxygen levels in the room below 15%, therefore suppressing the active chemical requirement to fuel a server room fire. This could suppress potential fires within 1-2 minutes, and will require pressure relief venting at point of use. This method provides agents with a form of a cooling mechanism. Using less gas, and less suppression of oxygen in the levels in the room, but high doses of the synthetic or chemical agent can be toxic. This system requires very diligent planning or design to minimise the risk of creating a toxic environment should you have a fire in the future. Once again pressure relief venting is important, and this type of system will activate its payload within 10 seconds. Choosing the right system for your server room or data centre is incredibly important, and 7TECH work with specialist suppliers to help you design a system that is right for your premises.